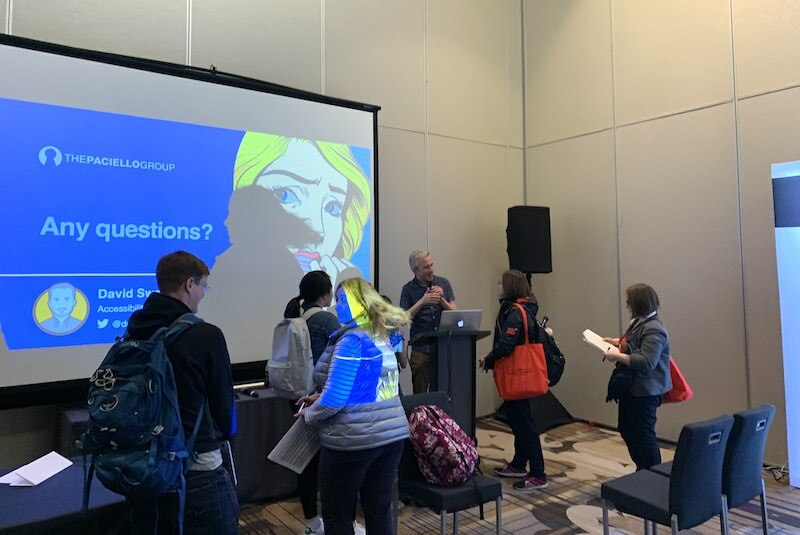 The 34th CSUN Assistive Technology Conference has come and gone (held March 11-15, 2019). It was another terrific event, and with approximately 5000 attendees! The big difference in this year’s event was the new location—the lovely Anaheim Marriott hotel outside of Los Angeles, California. The official Twitter hashtag is #CSUNATC19. Next year’s event is planned for the same venue next March 9 to March 13, 2020. Sandy Plotin (Managing Director, Center on Disabilities, CSUN) and Jennison Asuncion (Digital Accessibility Leader!) hosted the keynote event where Johanna Lucht, a Deaf Engineer at NASA, was honored. In addition, Sean Keegan, Director of California Community Colleges Accessibility Center, was announced this year’s Strache Leadership Award recipient. Below are a great list of session resources, a few announcements made, photos, and some fun tweets! Lastly, links to past CSUN events are listed. Accessible Animation: Redux (PPT) by Nat Tarnoff. Roads Less Traveled: When to Detour from Standards to Reach Accessible UX by Scott O’Hara. Future of Accessibility Guidelines for Web and ICT (Google Slides) by Shawn Lauriat & Jeanne Spellman. SVG Icons and Screen Reader Accessibility (PPT) (and SVG Slideshare) by Dennis Lembree (Web Axe author). ARIA-labelledby, ARIA-label, ARIA-describedby on Static Elements by David MacDonald. Design Systems that supports inclusive experiences (Slideshare) by Sarah Pulis and Andrew Arch. WCAG 2.1 update for designers by by Sarah Pulis and Andrew Arch. Emerging CSS Techniques & What They Mean for Accessibility by Marcy Sutton. Maybe AAA is Not So Bad? by Gerard Cohen. When and How to Caption Your Videos by Lucy Greco. 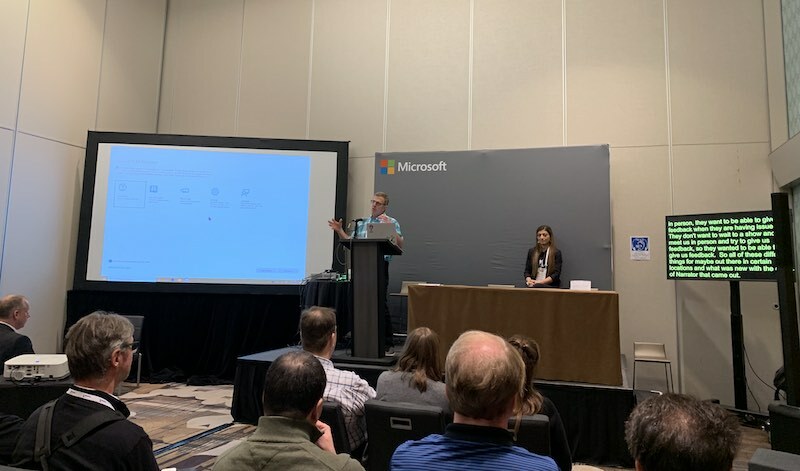 For much more, check the Great big list of CSUNATC19 accessibility presentations (Google Sheet). Also see the TPG CSUN 2019 Round-up and the Deque Systems Presentation Slides. Accessibility Insights—new tool to help solve accessibility issues before they reach your customers. For Web and Windows apps. Deque Systems is open-sourcing its axe accessibility rules for Android and iOS in addition to the existing axe-core Web rules. Narrator in the next release will work with the Chrome browser. Kate Sonka named next Executive Director of Teach Access. Please leave a comment with anything missed. Conference preview article by CSUN: CSUN Assistive Technology Conference Returns for its 34th Year at New Location in Anaheim. 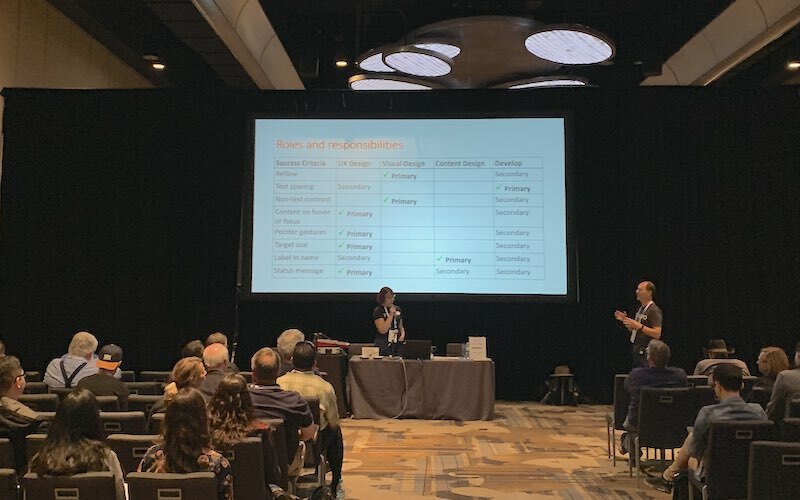 Accessible Pizza And Other Highlights From CSUN 2019 by Forrester. David Swallow answering questions after his session. Sarah Pulis of Intopia presenting. The 33rd annual CSUN Assistive Technology Conference will be held March 19-23, 2018 at the Manchester Grand Hyatt Hotel in San Diego, California. (It’s reportedly the last year in San Diego as the conference will move back to the LA area in 2019.) The keynote speaker is Daniel Goldstein, an attorney who has been involved in the field of disability rights for almost 35 years. If you can’t make it there, catch the keynote live stream on YouTube (5:30 PM PST Tuesday, March 20). Lainey Feingold‏ (@LFLegal) will be presenting her very popular Digital Accessibility Legal Update a few times, in large rooms, so everyone can attend, yay. 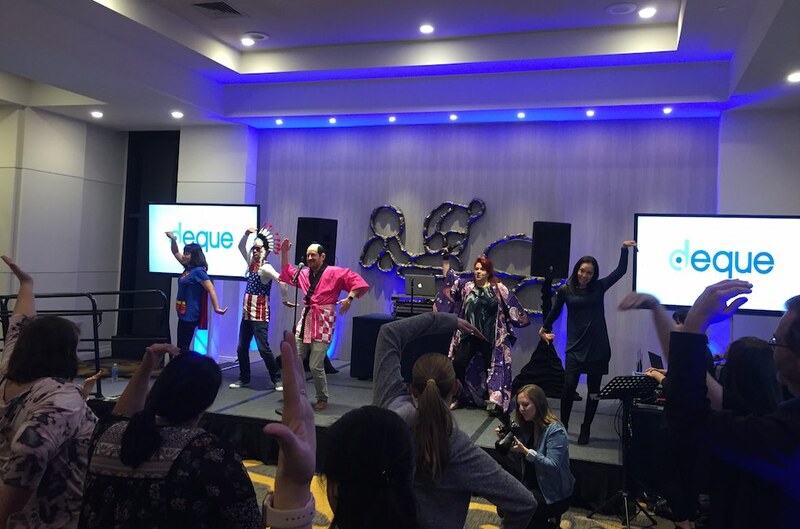 Deque Party and Accessible Karaoke: Palm Foyer, Wednesday, March 21, 6:30-10:00PM. 3rd Annual aXe Hackathon; Saturday, March 24th 10:00AM-3:00PM, at Downtown Works, 550 West B Street (short distance from conference venue). Microsoft Reception: Thursday, March 22, 7-9PM, Seaview Room (lobby level). So You Want To Start A Digital Accessibility Program? CSUN 2018 Schedule (Google Sheet). Check the Program Addendum for any conference schedule changes. CSUN schedule in Daisy format. The Exhibit Hall is free to attend but you must register. List of game accessibility talks at CSUN 2018 curated by Ian Hamilton. Last year’s Web Axe CSUN17 Review. 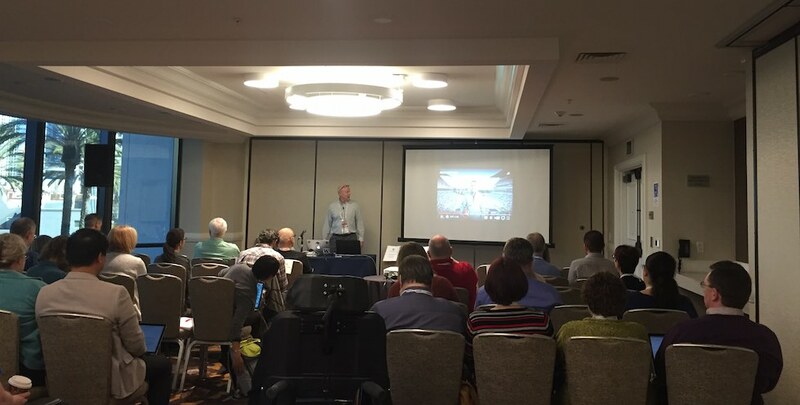 The 32nd CSUN Assistive Technology Conference is coming up soon—27 February to 4 March at the Manchester Grand Hyatt Hotel in downtown San Diego, California. This is the largest disability and technology conference in the world. Attending is quite an experience, so much learning, networking, sharing, and fun! If you’re unable to attend in person, there’s always great info from the conference on the web, and the Keynote Address will be streamed live on YouTube. The Exhibit Hall is free and open to anyone, simply register for Exhibit Hall only. Besides the workshops and sessions, there are many events happening. Look out for Accessible Karaoke, role=drinks, Google’s party (if you’re privileged enough to get an invite), a Microsoft social, the aXe Hackathon (Saturday morning), and a Structured Negotiation book party. There is no Tweetup this year. Web Axe author Dennis Lembree is co-presenting two sessions: Inclusive Design Fundamentals for Web and Mobile (workshop) and Creating Successful Accessibility Programs through Governance. The Twitter hash tag is #CSUNATC17 which is a new format. Tweeps are also using #CSUNATC and #CSUN17. The conference Twitter account is @CSUNCOD.